This is the best part where you both get to put your stamp on your day; nothing can be more personal than a marquee wedding where you get to create your own venue from start to finish. As most big celebrations are planned well in advance you will have time to think about how you want your wedding marquee to look. Lots of décor ideas can be done by yourself and don’t rely on a large budget but, if DIY decorating is cause for concern, read on as you may pick up some ideas which you hadn’t yet thought of. Themes and Colours: Here in Devon and Cornwall we have plenty of inspiration from the colours that surround us, from the aqua sea blues and golden sandy beaches to the rustic moorland tones. 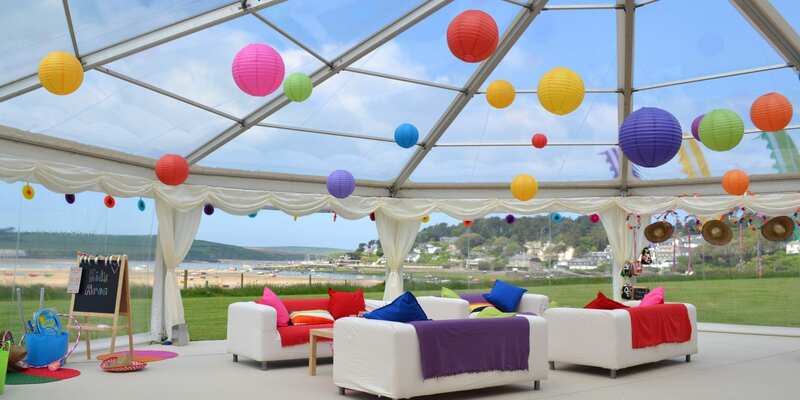 Whatever you choose you won’t be restricted because a marquee is the perfect blank canvas; don’t worry about whether a certain colour or theme will work, they all will! 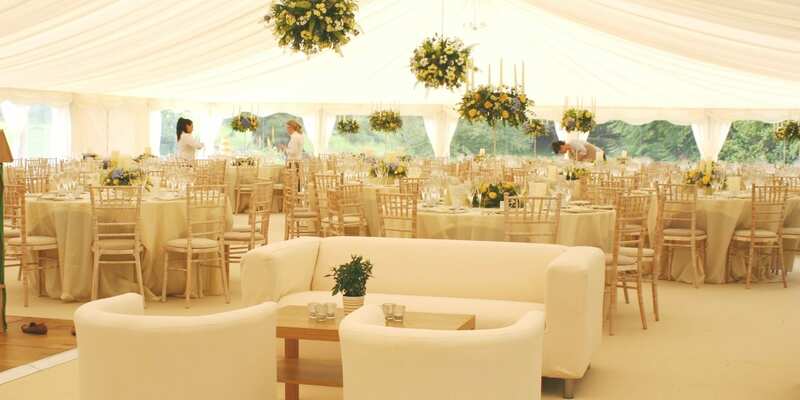 The marquee itself has ivory linings and our carpet is a neutral beige or champagne. However, we can supply swags or drapes in a range of colours if you want to add colour to the marquee linings to coordinate with a theme. Otherwise it is easy to bring a splash of colour into your marquee with flowers, lanterns, bunting chair sashes, table runner and much more! Themes are great fun and can be all inclusive from your invitations to decorating your wedding marquee – we have seen some great ideas over the years with fabulous beach themed weddings, autumnal feasts with pumpkin decorations, white winter weddings, beautiful vintage style decors, to colourful mardi gras style celebrations. However, you don’t have to theme at all; a beautiful traditional wedding marquee with plenty of floral displays is just stunning and very romantic! Wedding Flowers and Foliage: Traditionally flowers play a big part and are wonderful at adding colour to tables or make magnificent hanging displays. 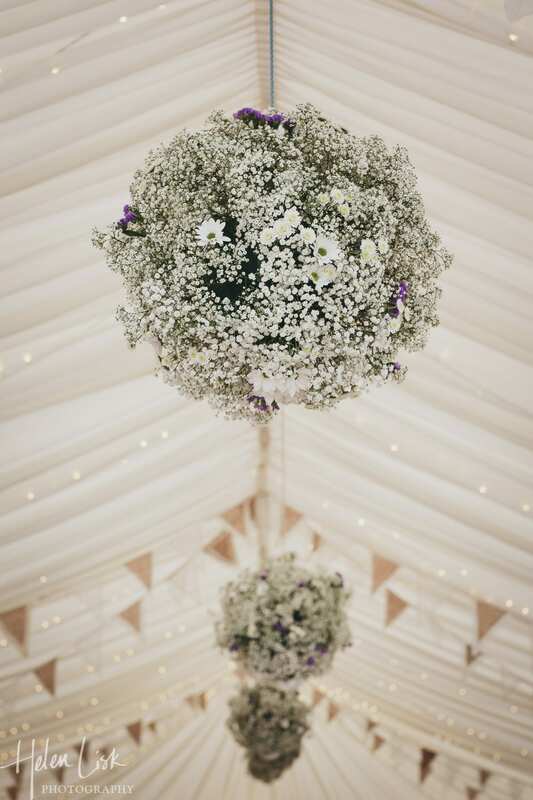 Stunning flower balls hanging from the roof of a wedding marquee. Olive trees, bay trees, lavender bushes or other pot plants are a great way of decorating and entrance or for creating a physical barrier between two different areas such as dining and bar area. If you don’t want to take on all the organising you can hire topiary plants and have them delivered to your site, so you don’t need to worry about having to do this all yourself! Olive trees and lavender are used to separate the dining and bar areas. 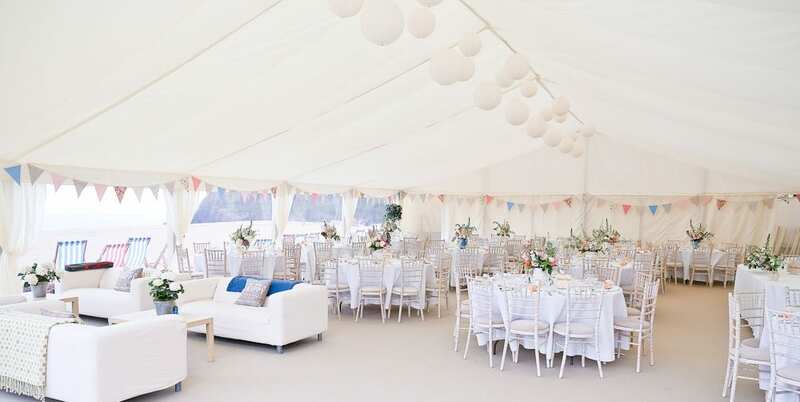 Bunting, Paper Lanterns, Pom Poms, and Hanging Decorations: we really recommend using the lofty roof space for decorating your wedding marquee. Use hanging decorations, to add atmosphere and colour. Whether you go bold, choose pastel shades or even white, bunting, paper lanterns, pom poms, foliage can be used to add the ‘wow’ factor to your event. Bunting and paper pom poms can be homemade for an individual touch, but there are also plenty of suppliers that you can buy or hire from. Paper Lanterns can be lit with small battery lights adding another dimension as the evening falls. You don’t have to use just one style of decoration; mix bunting and lanterns or hanging flower balls and bunting – it will look fantastic! 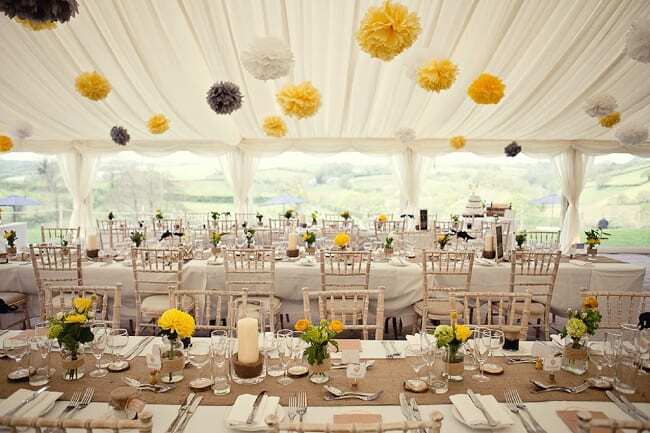 Clever use of colour makes this marquee look amazing with yellow, grey and white pom poms. If you opt for a clear roof marquee then you can really go to town with foliage; twigs, fairy lights, baubles and hanging lanterns can be used to great effect. 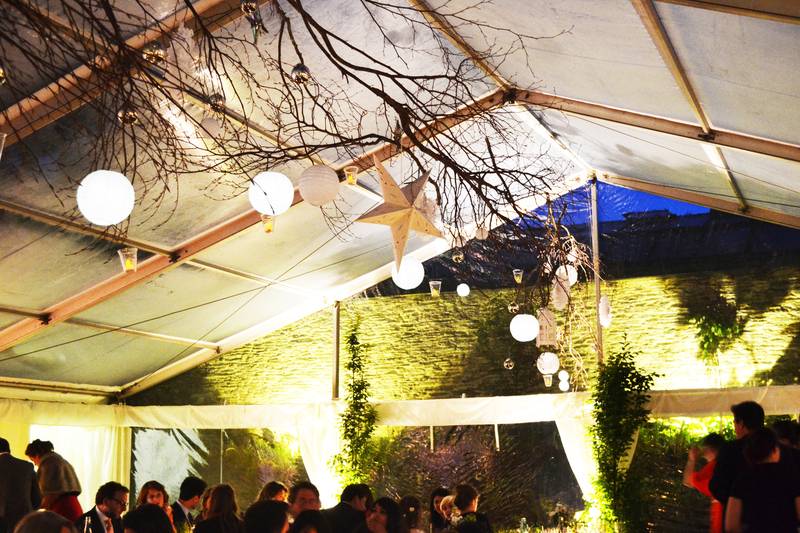 Clear roof marquee with hanging branches, baubles and illuminated paper lanterns. 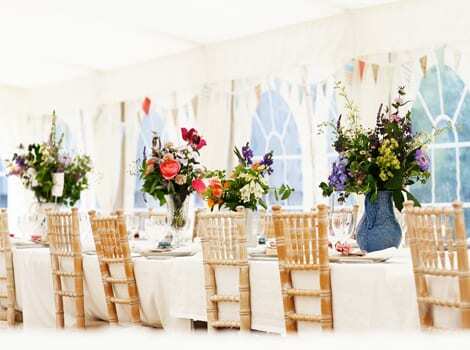 Seating Plans and Table Decorations: Bringing a bit of you both into your wedding marquee gives a lovely personal touch to your day and your guests will love it as well. Chances are that you will want a seating plan to direct guests to tables. So if you fancy being creative then there are many ways to help your friends and family to their seats, from surfboards, glass panel doors, lollipop sticks (beach themed wedding) and suitcases. And instead of table numbers, why not name your tables after your favourite places, drinks, food, animals. Have a think about something that reflects your interests and have fun incorporating it into your seating plan stand and table decorations. 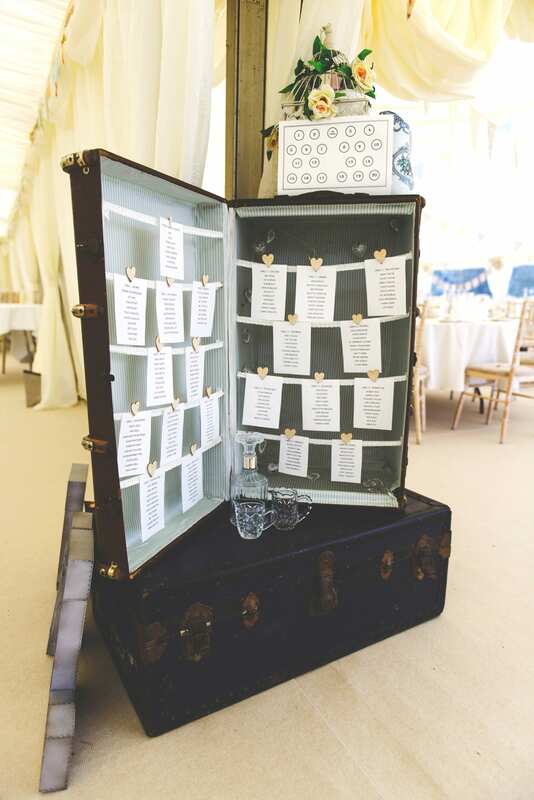 Suitcase table plan – genius! 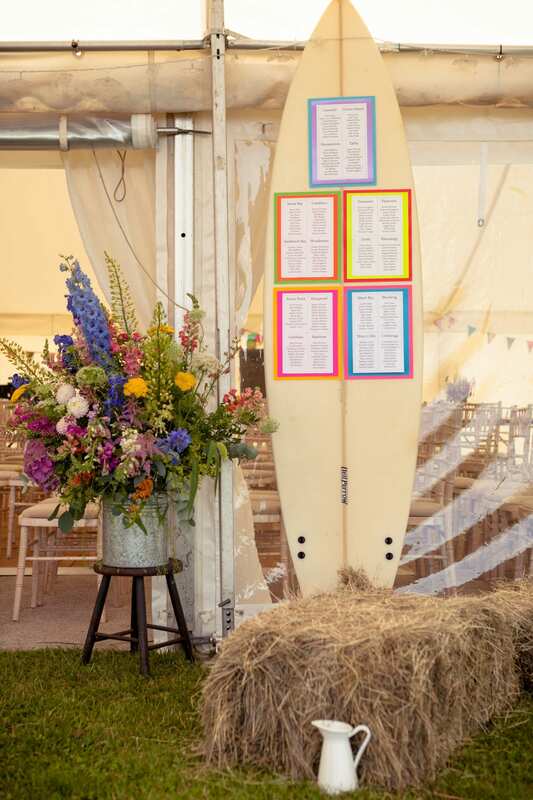 Surfboard as a seating plan – never go anywhere without it! And finally: Wedding preparations can be time consuming but hopefully lots of fun and remember there are many professionals on hand to help if you think you need it. 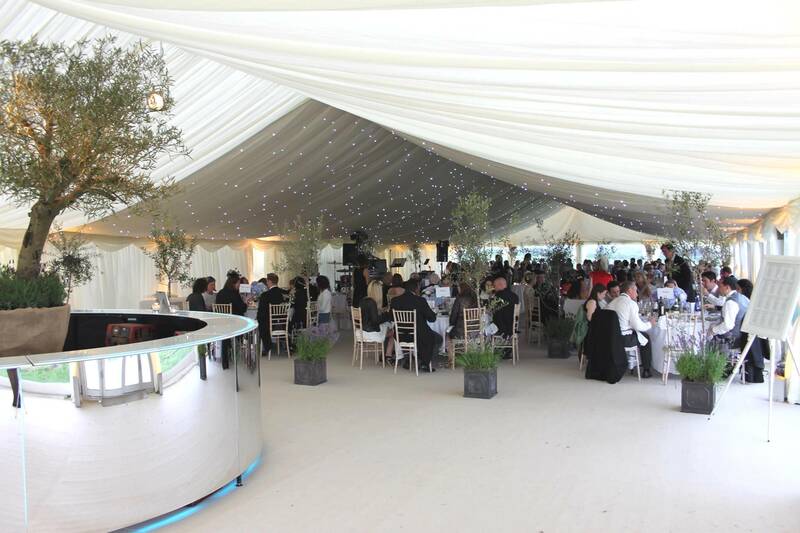 Take inspiration from others, our wedding gallery, pinterest and blogs are a great way of seeing what has worked for others and can help you visualise what your own marquee will look like. Take the best bits from what you find and pick and choose what you would like to include when decorating your wedding marquee. Whatever you decide, make your marquee all about you both, and ENJOY! If you have found this post useful please share it with your friends using the sharing links below! Thank you.